Welcome and wait for all the kids to arrive with coloring pages of blue. Took pictures of each kid with Joe in front of (plastic table cloth) Blue's house. Talked about Blue's Clue and that we needed to use Blue's Clues to find out what Blue's favorite part of Jack's bday is. First Activity Built Tickety the Clock from paper plates and paper...lead to finding first clue on a paper plate. Got handy dandy notebooks from side table drawer and drew first clue. Second Activity played musical paw prints. Each child stood on a paw print with a number on it. There were matching numbers in a bag. Music started kids walked around. Music stopped and so did kids. I pulled a number out of the hat, whichever child was standing on that number got a piece of candy. Went as many times as all kids got two turns....lead to second clue on a number candle. Third Activity was mail time. We sang the mail song. Each child had their own envelope with Shovel inside. Then we matched up Shovel to a giant Pail that was on the wall (a little like pin the tail on the donkey). At the end of this activity it lead to third clue on a yellow fork. 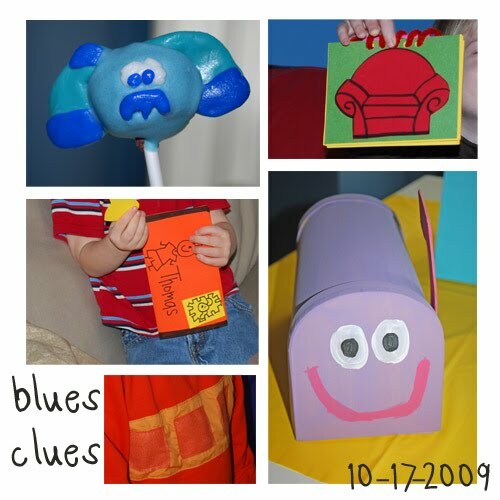 Now that we had all three clues we sat in thinking chair and figured out that Blue's favorite thing at Jack's birthday party was Eating Birthday Cake. Said our "thank yous" and "good byes"
Mom promptly collapsed on couch. I am super happy to share any and all details on how to pull all of these ideas off. If you want more detail on any part of this party feel free to email me see side of blog. I am exhausted just reading it! Sounds like a fun party! quite amazing, my friend. Hey, for some reason, my blog posts aren't updating on my friend's who have me on their lists. I've got tons of stuff on there since what shows on your page, if you want to check it out and see cute pics of my girl.